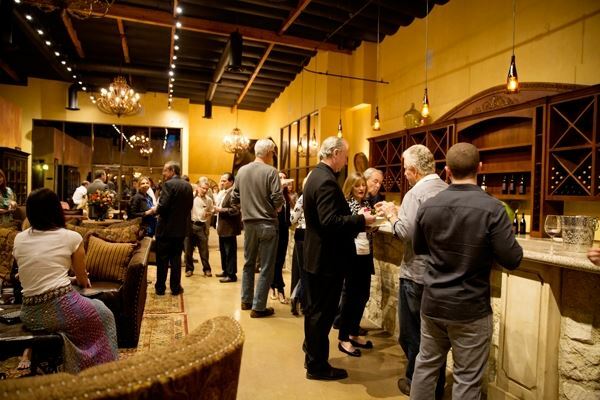 Aldabella Winery located in Westlake Village is ideally situated for great gatherings from intimate groups of friends and family to corporate events, class reunions, wedding rehearsals and large parties. A vast array of catering partners provides you with a myriad of food choices and our elegant, relaxed Mediterranean venue can be arranged to meet your specifications. We have two unique spaces to suit your needs. The perfect place to host your next intimate dinner, bridal shower or bachelorette. Our luxurious dining room seats 15 comfortably (18 max) and is sure to provide the perfect Mediterranean ambiance. Working with some of the best chefs in Ventura and Los Angeles County, we will work with you and your choice of caterer (from preferred catering list) to make sure you have a memorable dining experience. Whether you want simple appetizers or a five-course meal, we are able to provide the highest quality food (and wine, of course). A wonderful space to host your next special event! Fit for 15-70 people, the tasting room is filled with plenty of natural light and has adequate space for drinking, dancing, and eating. You’ll feel right at home in this Tuscan-inspired dining and living space. Our AV system and large flat screen television make it easy for your presentation needs, whether it is a business review or a family slideshow.